Rudy is one of the country’s premier intellectual property litigators. With only one exception, Rudy has not lost a trial, arbitration or other case-dispositive motion in well over a decade. The exception involved a case in which the jury verdict obtained was ten times lower than the amount sought by plaintiff in closing argument. During this time, and for each case not settled following decision, Rudy has been affirmed on appeal. At the same time, he is well-known for shaping litigation solutions that make economic sense for businesses. For more than 25 years, Rudy has litigated and tried disputes over patent, trademark, copyright, trade secret, internet and First Amendment matters in district and appellate courts throughout the United States, including notable jurisdictions such as the Eastern District of Texas, the District of Delaware, and the Central and Northern Districts of California. Additionally, Rudy handled argument before the U.S. Supreme Court in a case that altered the balance of power in patent litigation. Prior to entering law school, Rudy worked as an engineer for a leading defense contractor, applying his skills in the areas of avionics systems engineering and software development. Managing Intellectual Property, Case of the Year, Editor’s Choice: Octane Fitness, LLC v. Icon Health & Fitness, Inc.
From a pure legal standpoint, the issue was whether the use of player statistics to play fantasy sports violated player rights of publicity and, even if it did, whether the First Amendment trumped any such state rights of publicity. At the time of the suit, the fantasy industry was valued at $1.5 billion annually. A deeper dive into the facts revealed a much more compelling story for the fantasy industry and against Major League Baseball than that signaled by the pure legal issue. As it turns out, Major League Baseball played no part in developing fantasy sports. An editor for The New York Times thought of it. In the 1980s, devoted fans created and managed their own statistical games with an estimation of 500,000 fans playing annually. In the 1990s and moving forward, software companies like CBC developed state-of-the-art software to manage the statistic interface and to create many forms of interesting fantasy games. The software made it far easier for the average fan to play and track the games, dramatically increasing the popularity of fantasy sports. At the time of the suit, an estimated 15 million fans played fantasy sports annually. CBC brought in many witnesses to explain in detail how fantasy sports had actually made Major League Baseball far more money by causing devoted fans to watch many more games than just those of their home town team and encouraging them to buy more merchandise, satellite television packages and fantasy sports media, to name just some of the benefits. Indeed, the fantasy industry helped Major League Baseball and its players; it had not damaged them in the least. This compelling version transcended the mere legal issues. CBC prevailed at the District Court level and was affirmed on appeal. 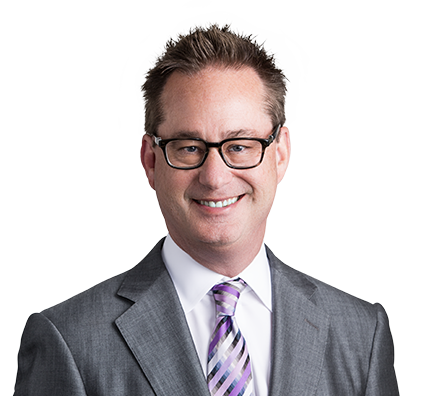 Provided lead counsel representation of Octane Fitness LLC (Octane Fitness LLC v. Icon Sports) before U.S. Supreme Court in appeal of denial of attorneys' fees in patent infringement case. Obtained summary judgment on infringement claims against Octane Fitness and District Court denied fees. Merits and reply briefs to U.S. Supreme Court were authored by team and joined by numerous amici, including U.S. Solicitor General. In Octane Fitness LLC v. Icon Fitness and Health Inc., Supreme Court reversed Federal Circuit and set totality of circumstances standard for finding exceptionality to award fees under 35 U.S.C. § 285. Case garnered significant national media attention and altered balance of power in patent litigation. On remand, District Court finally found original claims against Octane Fitness exceptional, and team secured fee award of $1.4 million for client. Rudy handled oral argument before Supreme Court. Represented CDM Fantasy Sports against Major League Baseball, making new law in turning back Major League Baseball’s attempts to monopolize $1.5 billion per year fantasy sports industry. Case ended with Supreme Court denying certiorari. (CBC Distribution v. Major League Baseball) Filed amicus brief on behalf of Fantasy Sports Trade Association in Indiana Supreme Court case Akeem Daniels, Cameron Stingily and Nicholas Stoner v. FanDuel, Inc., and DraftKings, Inc. Court issued unanimous ruling in favor of FanDuel and DraftKings. Rudy loves spending time with his children. His daughter is the captain of her high school golf team, so he spends a lot of time on the course playing with her and watching her play. 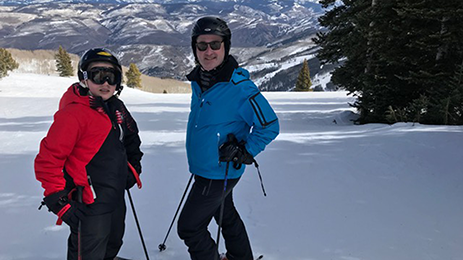 Rudy likes to ski with his son in Vail, Colorado. As a family, they enjoy traveling to big cities like New York City and Washington, D.C.
Rudy enjoys exercising and staying in shape. He likes to walk, jog and lift weights. Rudy also likes to fish. 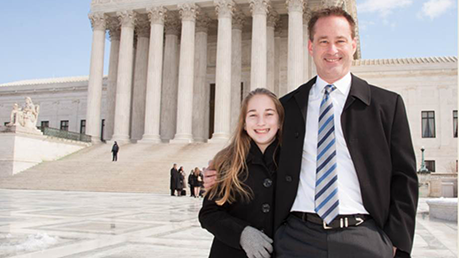 Rudy and his daughter, Natalie, following his U.S. Supreme Court argument. Rudy and his son, Jacob, skiing in Colorado.